At Football Medicine® we always welcome the sharing of relevant knowledge to the sports medicine community, reason we challenged the Portuguese physiotherapist Bruno Rodrigues to provide an external collaboration to our project, writing a brief article regarding some ideas he shared previously in his personal page and trying to find if it is, nowadays, possible to predict injuries in football. Bruno Rodrigues (below) is graduated in physiotherapy, however, his postgraduate studies are more into the Strength & Conditioning and High Performance areas. 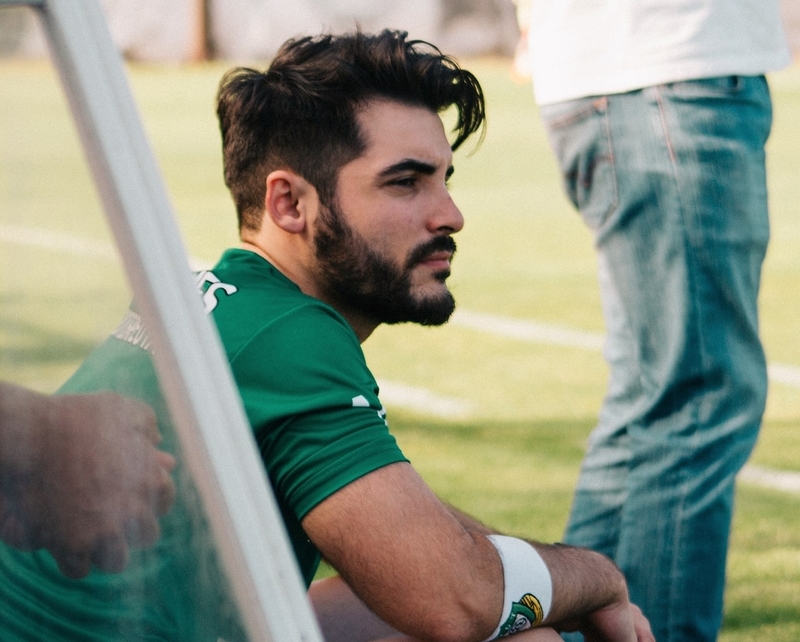 He is currently in a private clinic where he is responsible for the sports rehabilitation and performance enhancement of his clients, although he still works as a physiotherapist in a football club in Portugal. Answering “Yes” to the title of this article is a goal shared by thousands of football professionals spread all over the world. 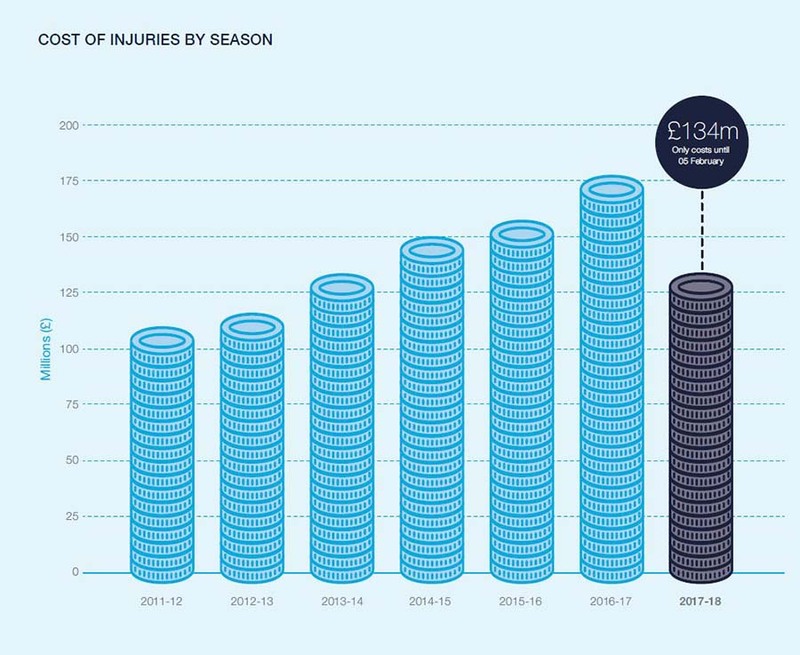 The reasons are obvious: as the competitive level rises, the financial impact of the football players injuries skyrocket (£134m in the 2016/2017 Premier League) and the team’s performance follows an inverse path (Hägglund et al., 2013). We might think that we are getting closer and closer to the intended response, nevertheless, as we move forward with more methodologies, more technology, we come to the conclusion that a dichotomous answer may not be that obvious. Taking in consideration a semi-professional context, and knowing that not such high amounts of money are involved, the prediction and prevention of those same injuries are also extremely relevant once the “survival” of the club might be dependent on key players, that due to money constraints, are not able to be replaced if injured. Having all these in mind, in this article, we will reflect and explore the evidence about some of the trendy methods/assessments/screenings to “predict” injuries and ultimately trying to answer the question of this article. Is the Functional Movement Screen (FMS) enough? Based on the work of Smith & Hanlon(2017)it is possible to deduce that a cut-off value of 14 in the FMS does not allow us to predict the occurrence of injury in that player, compared with others with higher scores, when subjected to the same training / game routine. So, does this mean there are no reasons to perform this assessment? If considering a strictly injury prediction point of view, probably it won’t be that valuable, especially if no other data from other tests are added or put in context together with the FMS. However, it is important to underline that this screening might play a role on exercise selection/prescription, which might be relevant for the S&C coach or physiotherapist of that team, either in the conditioning and/or prevention program. Is the Isokinetic Dynamometer (IKD) Testing enough? Regarding the isokinetic evaluation the same question can be raised: can this “flawless” test be enough to predict injury? The study by Green, Bourne, & Pizzari (2018) documents low predictive values ​​for absolute and relative maximum eccentric strength of the hamstrings at 60°/s for consequent strain injury of the same muscle group. The applied methodology failed to find predictive values ​​in the remaining data. At the same time, those results contrasts with a body of evidence which correlates the functional Q/H ratio as a marker of injury risk, as related by Croisieret al. (2008) with a follow up of 462 players in-season. Those outcomes can be interpreted as a “group effect”, which can’t tell us about the individual risk of sustaining an injury (Van Dyket al.,2017). In the same study, a 14% increase in the preditive risk of injury was found when athletes showed decreased hamstrings strength (using Odds Ratio method). Besides not showing evidence of being able to clearly predict injuries, this doesn’t mean that the IKD testing lost its value, once it is undoutably a reliable tool for muscle strength testing, which might be contributing for injury occurrence in football (Van Dyk et al., 2017). 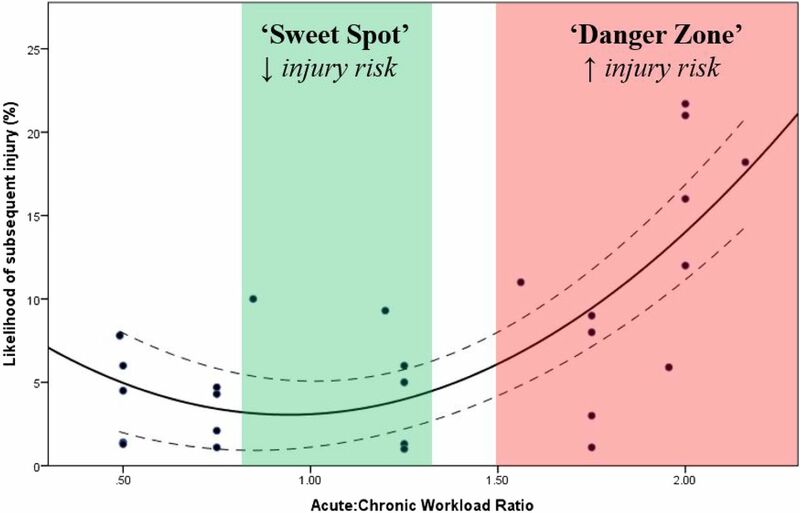 Do Acute/Chronic Load Ratios predict players’ injury? Based on Gabbett (2016) review, McCall, Dupont, & Ekstrand (2018) analyzed the internal load using the session Rating of Perceived Exertion method (sRPE) finding an association between weeks with loads of 1.3-1.4 and the incidence of non-contact injury in elite soccer players. Still, its predictive power did not allow to individualize which players would get injured. In a multidimensional analysis (GPS, sRPE), Rossi et al. (2017) argue that variables such as: history of previous injury (especially in the first three days after return-to-training), distance of high metabolic load (above 25,5 W/kg) and sudden decelerations (above 2 m/s2) have a direct impact in their predictive value of injury, when following their approach and algorithm. However, those predictive values only appeared after 16 weeks of data collection. 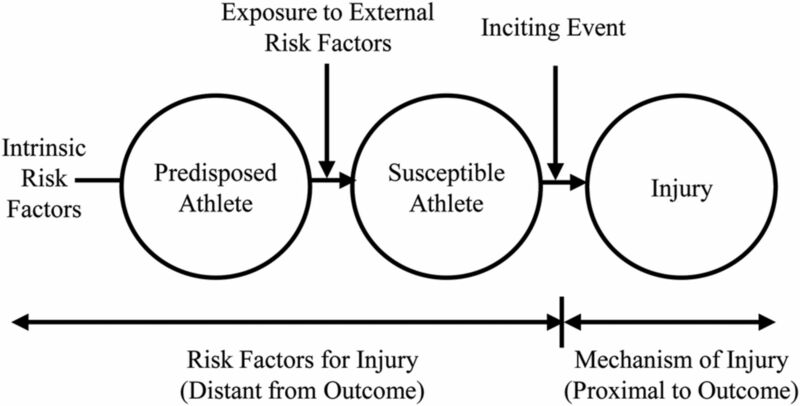 This leads us to a conclusion: in the end, all of these are indicators of the proximity to which a certain athlete or group of athletes are from suffering an injury. However, in sports this event is inevitable and, until today, not clearly predictable. If we consider the moment of injury as “a fall from a certain height”, none of these indicators can tell us when the athlete will be “pushed” to the fall. Instead, we are told how close to the edge the athlete is; and, the closer he is, the less disturbances he will tolerate before finally falling. Croisier, J.-L., Ganteaume, S., Binet, J., Genty, M., & Ferret, J.-M. (2008). Strength Imbalances and Prevention of Hamstring Injury in Professional Soccer Players. The American Journal of Sports Medicine, 36(8), 1469–1475. Gabbett, T. J. (2016). The training-injury prevention paradox: should athletes be training smarter and harder? British Journal of Sports Medicine, 50(5), 273–280. Green, B., Bourne, M. N., & Pizzari, T. (2018). Isokinetic strength assessment offers limited predictive validity for detecting risk of future hamstring strain in sport: a systematic review and meta-analysis. British Journal of Sports Medicine, 52(5), 329–336. Hägglund, M., Waldén, M., Magnusson, H., Kristenson, K., Bengtsson, H., & Ekstrand, J. (2013). Injuries affect team performance negatively in professional football: an 11-year follow-up of the UEFA Champions League injury study. British Journal of Sports Medicine, 47(12), 738–742. McCall, A., Dupont, G., & Ekstrand, J. (2018). Internal workload and non-contact injury: a one-season study of five teams from the UEFA Elite Club Injury Study.British Journal of Sports Medicine, bjsports-2017-098473. Smith, P. D., & Hanlon, M. P. (2017). Assessing the Effectiveness of the Functional Movement Screen in Predicting Noncontact Injury Rates in Soccer Players. Journal of Strength and Conditioning Research, 31(12), 3327–3332. 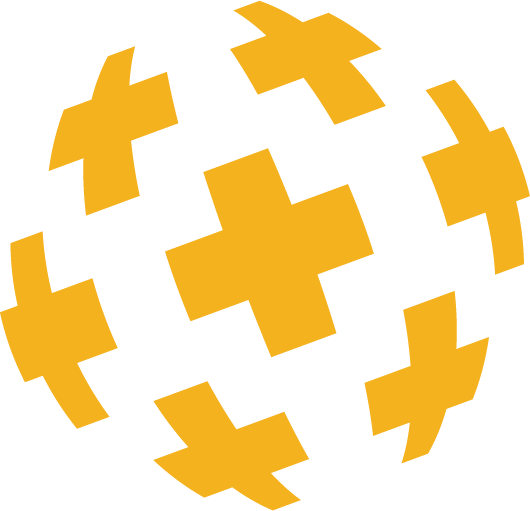 Van Dyk, N., Bakken, A., Targett, S., & Qatar, R. B. (2017). There are many good reason to screen your athletes. Aspetar Sports Medicine Journal, 6, 12–17.